Leaving the house in the morning can be hectic with children. Parents want to feed their children healthy, balanced meals that will get them through the morning, but it can be hard to think of healthy breakfast ideas that the children will like. Here are some quick and easy breakfast options. Preheat the oven to 350°F. Lightly grease a square or rectangular baking dish. Mix the oats, baking powder and cinnamon until they are well mixed. Combine the syrup, milk, egg and butter. Place the sliced bananas in a single layer on the bottom of your baking dish. Top the bananas with half of the berries. Pour the dry oat mixture over the fruit in an even layer. Then, pour the liquid ingredients evenly over the oats. Place the remaining berries evenly on top. Bake for 35-40 minutes or until the top is browned. Let the oatmeal cool a few minutes before serving it. If you make it the night before, cover it with a sheet of aluminum foil and place it in the refrigerator so you can reheat it in the morning. Place each banana half in a cereal bowl and top each with half of the yogurt. Then, sprinkle half of the granola, flax seed and berries on each. Preheat your oven to 350°F. Spray a cupcake tin with cooking spray. Mix the spinach, olive oil, salt and pepper in a bowl. In a separate bowl, mix the eggs and egg whites. Add the eggs to the spinach mixture, and then add the shredded cheese. Mix well. Pour the mixture into each cup in the cupcake pan until the cup is halfway full. Bake until the omelets are fully cooked, which will take about 20-24 minutes. Let them cool about two minutes and serve them, or wrap them up in foil and store them in the refrigerator for the next morning. Reheat them in a microwave or toaster oven. Grab a piece of your child’s favorite whole grain bread and spread on a nut butter. If you have a nut allergy in the family, try a butter made from roasted sunflower seeds. Then, drizzle on some local honey and serve the sandwich with a glass of almond milk or orange juice. For added flavor, you can place a few slivers of apple on top or sprinkle the sandwich with dried cranberries. What do we do when our preschooler asks about someone’s physical disability? What do we do if any of our children have a physical ailment and someone has questions? How would we want other people to talk to our children about the children’s condition? How would we want the children to react to people who stare or ask them awkward questions? With the help of Goddard School parent, SooAnn Roberts Pisano, who is the mother of a child with Epidermolysis Bullosa (EB), we are providing some tips for teaching our children appropriate ways to approach someone with a visible disability or ailment. Society and tradition have taught us that staring and pointing is rude, and typically it is. However, SooAnn Roberts Pisano points out that teaching our children not to stare “does not teach us to see with our eyes in the same way we would naturally. It essentially instructs us to pretend like you have zero interest at all in what we are seeing and try to appear as natural as possible. It instructs us to remain ignorant about what we do not understand.” We don’t need to allow staring, but we do need to explain to our children that taking an interest in others and seeking to understand their disabilities or differences is important. How do children with disabilities or conditions that make them appear different than others deal with the stares and questions? While no solution works in all situations, Pisano developed some simple tips from her personal experiences, comments from adults with disabilities and parents of children with special needs. These can help us approach people with disabilities and educate ourselves and our children to embrace and understand differences. Smile. When you catch yourself staring at someone, smile at the person in acknowledgment. Teach your children to smile at people they see and not to fear those who look different. Ask, “May I ask you about ____?” When you notice someone with a disability or a genetic disorder, show interest and respect by asking them about themselves. Let the person say no. If the person doesn’t want to talk about his or her situation, he or she will let you know. The person might tell you where you can find more information. Use the K.I.S.S. principle and Keep It Short and Simple. Never use questions like “What’s wrong with him?” This can be highly offensive. A person may have a disability or a genetic disorder, but that does not mean there is something wrong with him or her as a person. A better question to ask may be “May I ask you about your son/daughter’s skin/bandages/condition?” If you are the parent of a child with a disability or genetic disorder, keep your explanations short and simple. Any detailed explanation or any explanation involving medical jargon may confuse the listener. Keeping your explanation simple will help your child learn how to talk about his or her condition if you are not around. Say thank you. If you’re the one asking the question, thank the disabled person for letting you ask. If you’re the one being asked, thank the questioner for asking. Even if the question results in the most awkward conversation you have ever had, these conversations help us fight ignorance instead of passively promoting it. This is not a simple subject. Conversations about disabilities can be awkward, but we shouldn’t avoid them and remain ignorant about those around us. We can make a better society by taking an interest in those around us, teaching our children how to ask someone about their appearance or disability in a polite manner and embracing that people’s differences make our world amazing, inspiring and bright. The next time we find ourselves staring at someone, we should choose to understand that person’s situation rather than ignore it. You may have heard the term ‘world schooling’ recently. World schooling uses travel to teach children about the planet and world cultures. As the use of technology increases, the world has become more interconnected, and one country’s problems can affect our personal lives. An early educational experience should include a global perspective. At The Goddard School, we provide children with opportunities to learn about other cultures, develop a greater understanding of new ideas and increase compassion for people who may appear very different. Make a craft based on one from another culture. 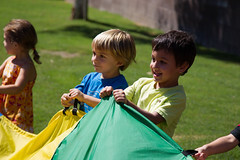 Instilling confidence in young children helps them develop their social skills and a sense of self-worth. When we feel good about ourselves it shows; situations seem easier to handle and we communicate in a more upbeat and positive manner. That positivity can spread to others. Smiles are contagious! Children need to feel validated and loved. Their parents’ positive reinforcement and encouragement helps them gain confidence, and once they are in school, educators and peers also influence their self-worth. How children feel affects how children act. Our children are in tune with our actions, so what we feel and perceive can influence our children. A positive self-image provides a strong example to children and helps them feel good about the world. Since children can mirror our behavior, we need to lead by example and model confidence. Bad days happen, and sometimes we feel overwhelmed or down for no reason. When we feel unhappy, it is a good idea to remind children that challenges are a part of life, and we feel happy and fulfilled on most days. If we aren’t happy, we owe it to ourselves and our children to seek out ways to feel fulfilled and joyful, which may include reading, meditating, exercising or listening to music. Parents influence their children’s sense of self-worth. Our children should like who they are and feel comfortable in their own skins. Children should feel as though their voices will be heard and as though they can make a difference in the world. We help them develop a healthy sense of self-worth by acknowledging their strengths and the qualities that make them unique. Everyone seeks praise and responds positively to compliments. Children develop a positive self-image when their parents acknowledge their strengths, trust in their abilities and see mistakes as opportunities for learning and growth. The people around us can affect how we act. Our values may differ from other parents’ and children’s values. Part of our job as parents is to get to know our children’s friends and their parents, and observe any behavioral changes in our children, positive or negative. We can’t always choose who our children befriend, but we can encourage them to play with children who will make them happy. Make time to talk to other parents at your school’s drop-off or pick-up times. Talk to your children about their play dates, and pay attention to their attitudes afterward. Are they smiling and excited about the fun they had, or are they withdrawn? Children need to be able to express how they feel, but also able to control their tempers. Suppressing feelings does not help children deal with the issue and keeps them from learning how to communicate effectively with others. Finding the right balance is difficult, but if we model healthy ways to talk about our feelings, children will learn how to express how they feel in a mature, controlled and age-appropriate manner. At The Goddard School, our talented teachers collaborate with parents to nurture children into respectful, confident and joyful learners. We are committed to teaching children about compassion, cooperation and the significance of giving back to their community. 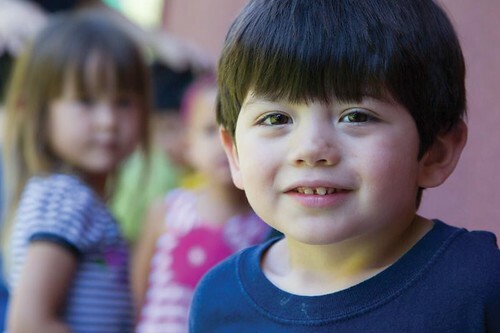 We pride ourselves in collaborating with the best educational and child development organizations to provide children with the skills they need for long-term success in school and life.